There are thousands of varieties of rice, and they come in assorted colors, lengths, textures, and nutrition value. If you are a bodybuilder or are serious about fitness, and we’re pretty sure you are considering you’re checking out our website, we know that you eat a healthy diet to provide your body the nutrition it requires for maximum results. After all, the only way to see real, sustainable results is 80 percent diet and 20 percent working out. No matter who you are, you can’t out exercise an unhealthy diet. Rice is a staple in a lot of diets. It’s relatively cheap, can be filling, and since it doesn’t really have much flavor on it’s own, it is an easy addition to lots of recipes. When it comes to rice, you may not know what types are the healthiest for you. In comparing basmati rice vs. brown rice, which would you choose? 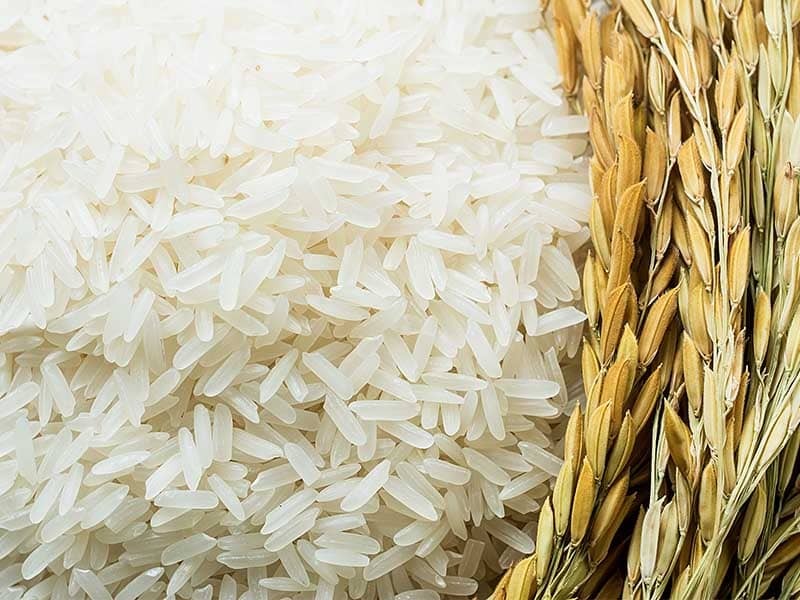 Let’s take an in-depth look at both types of rice, as well as other varieties, to see if we can figure out the winner that will ensure you stay on track with your goals. First, let’s see what the difference is between basmati rice and brown rice. Basmati rice is a long-grained, aromatic brown or white rice that comes from the Indian subcontinent. The sometimes spicy, sometimes nutty aroma comes from a specific compound unique to basmati, 2-acetyl-1-pyrroline. This compound is used as a flavoring agent for certain cheeses and cereals manufactured in the United States and Europe. Basmati rice has a unique compound which gives it its nutty aroma. Cooking loses most of the 2-acetyl-1-pyrroline, so if you prefer to keep the aroma around once cooked, try soaking the rice for at least 20 minutes prior to cooking. This not only retains more of the compound within the cooked rice, it also helps shorten the overall cook time by about half. Brown rice is a whole grain and can come in both long- and short-grain varieties. The outermost layer, called the husk, is inedible and removed to produce the brown rice. The outer layer of brown rice gives it a chewy texture and a nutty aroma. The exposed bran layer is what gives brown rice its chewy texture once cooked and also what provides its nutty aroma. White rice is processed further, removing the bran and germ layers underneath. This creates a softer, more sticky consistency than brown rice once cooked. Let’s take a look at the side by side nutrition facts for 1 cup of basmati rice vs. brown rice to see how they compare. Based on the nutrition information above, the brown rice has a higher fat content but also has more potassium and dietary fiber than basmati rice. This allows you to feel fuller longer to reduce snacking and potential overeating, as well as helping with digestion issues and constipation. 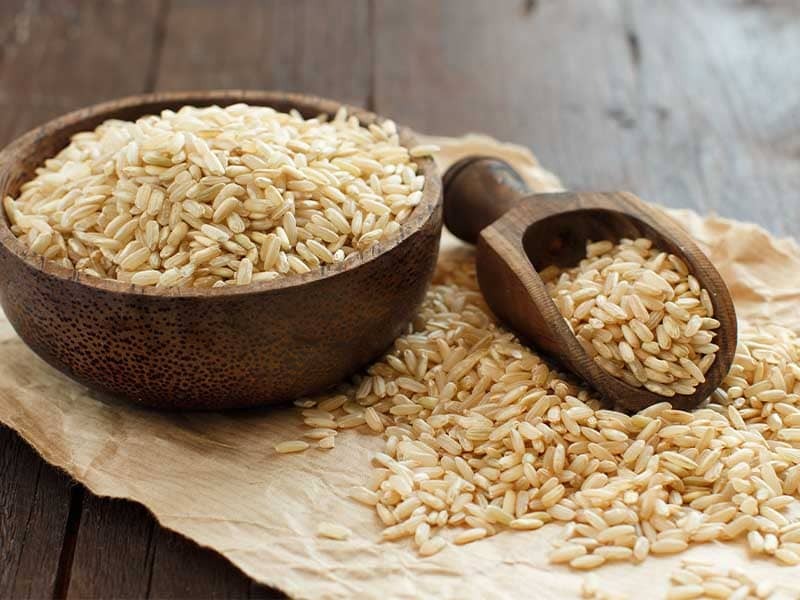 Brown rices offer both soluble fiber and insoluble fiber. Soluble fiber helps to slow digestion so that food has time to break down in your system. Insoluble fiber helps to add water bulk to stool and move food along the intestines to promote proper digestion and reduce constipation. The addition of insoluble fiber in the daily diet is very important as most people do not eat enough of this type of fiber for health and disease prevention. Both rices contain all eight essential amino acids, and especially high concentrations of selenium and manganese. One cup of rice offers as much as 88% of the daily value of manganese, which helps carbohydrates and protein metabolize correctly and control the nervous system. Selenium helps support proper thyroid function and has even been said to protect against certain cancers. Brown and basmati rice are both gluten-free, high in carbohydrates but have no cholesterol. It is a great way to provide energy to fuel workouts and essential minerals that your body needs to function at its optimal level. As we mentioned earlier, there are thousands of varieties of rice being produced and consumed around the world. Let’s take a quick look at some of the other notable varieties and compare them to basmati rice and brown rice. Jasmine rice is a long-grain brown rice grown in Asia, primarily in Thailand, Cambodia, Laos and Southern Vietnam. It can be enjoyed as brown rice or further processed to expose the white rice grain. The same compound agent found in basmati rice is found in jasmine rice, giving it a sweet aroma. Jasmine rice has a sweet aroma. In comparing jasmine rice vs. basmati rice, which is healthier? These two rice types are very similar, but you can tell cooked basmati as it is longer and skinnier than jasmine rice. Both come in a brown and white option, with the brown rice being a healthier alternative than the white rice. Once cooked, basmati becomes dry and fluffy while jasmine is shorter and stickier. This also contributes to jasmine’s higher glycemic index over basmati rice. The nutrition value for both jasmine rice and basmati rice are similar, but due to jasmine’s higher glycemic index, basmati rice would probably be a better choice out of the two varieties. 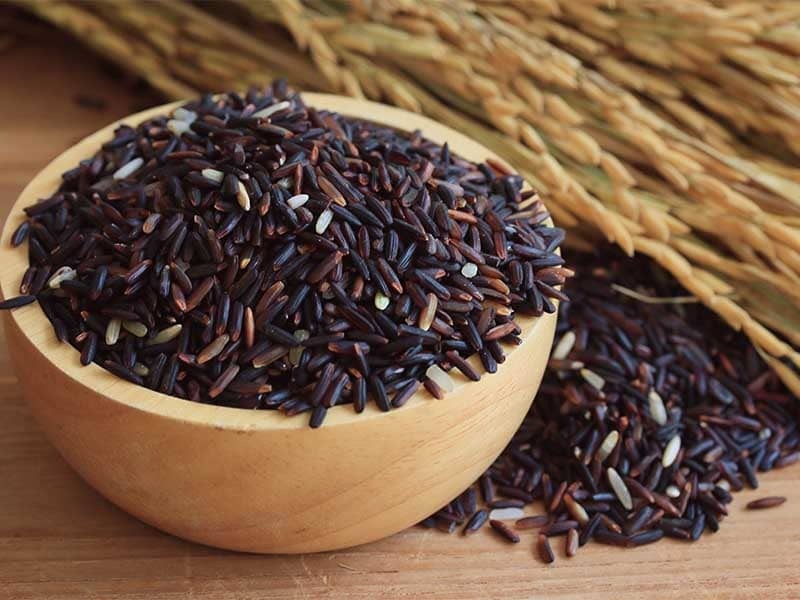 Black rice is a less popular and more expensive variety of medium-grain rice, sometimes called “forbidden rice” or “Emperor’s Rice.” It gets its name from the color of the rice grain, provided by antioxidant anthocyanin, for which it has the highest concentration than any other food. Black rice is a great source of antioxidant anthocyanin. This heirloom rice comes from Asia, specifically China. Many years ago, all black rice seeds were taken to the Emperor’s palace and stored there, to be grown and consumed only by the royal family. Emperors believed that consuming black rice regularly would help extend their life. Anyone found to have black rice who did not belong to the royal family lineage would be punished and could be put to death. For centuries, black rice was unavailable to the general public, but lucky for us, you can now find this superfood in grocery stores and online. Since black rice has more antioxidants than any other rice variety, it will generally be healthier for you than brown rice or white rice. In a debate on what is healthier, black rice vs. white rice, the clear winner would be black rice due to its higher nutrient content and levels of anthocyanin. However, the cost might be hard for some to swallow. You will easily pay two or three times if not more the cost of white rice when purchasing black rice. For some, the cost to eat healthier is worth it, especially for people who love rice as part of their regular diet and find it hard to give up. If this sounds like you, one way to save money is to buy different rice varieties. This way, you can choose which variety best fits the recipe or goes along with your current meal, and you will save money while enjoying different rice textures and flavors. The glycemic index is a scale used to determine how your body handles sugar on a scale from 1 to 100, with the lowest levels being best. Whether or not you have diabetes or are at risk, you will want to pay attention to the foods you eat and their glycemic index. Too much can make your blood sugars spiral out of control and may lead to type 2 diabetes. When comparing basmati rice vs. brown rice on the glycemic index scale, we find that they are very similar. There are quite a few factors that go into the glycemic index of a food, and the way it is prepared and the foods eaten along with it also factors in as well. As you can see, white rice is high on the GI scale and basmati and brown rice tie for low to medium. If you are concerned about keeping your blood sugars in control, you can reduce the overall glycemic index of your meal by pairing your rice of choice with foods like sweet potatoes and beans. The Glycemic Index Foundation has some great tips and food ideas for eating a lower GI diet. An important point about the Glycemic Index is that those numbers can become skewed when combined with protein foods, especially those that are higher in fat such as red meat or cold water fish like salmon. Another benefit to eating low glycemic index rice is that it helps to reduce belly fat while keeping blood sugars level. This is very important for any bodybuilder looking to bulk up in muscle and keep fat to a minimum. For a lot of people, cost of food is a huge deciding factor when determining what to purchase from the grocery store or farmer’s market. You can imagine with the amount of different rice varieties, there is also going to be a difference in price as well. The cheapest rice variety is white rice, with jasmine rice being the next cheapest. Any brown rice you get will be more expensive. The price difference between plain brown, jasmine, and basmati rice are usually pretty small. Black rice will be the most expensive rice variety that is available on the market today. Purchase in bulk – there are pros and cons to having bulk memberships at places like BJ’s, Costco, and Sam’s Club. If you have one or have a friend or family member who will let you use theirs, you can reap the benefits of buying larger quantities of rice. Share with others – This is especially worthwhile if you purchase in bulk. You could offer some of the rice to others, and have them pay for their portion to help offset costs. This could be a good way to affordably buy more than one type of rice in bulk to reap different benefits from the offered varieties. Check out your local Asian market – if you happen to have an Asian grocery store nearby, definitely check them out to see what they have available. Not only will you find rice options that aren’t available in other stores, but you will find better prices as well. Spend some time checking out other aisles to find some unique foods you won’t find anywhere else in the U.S.! Restaurant supply store – if you happen to have a restaurant supply store nearby, you can get a good deal on bulk rice, sometimes even better than the bulk membership stores. Do your research before you go though, because they don’t always allow regular consumers to shop there. Online – of course, you can find most anything online these days. Do a quick search to see what the going rate is for your preferred rice variety, and see how it compares to the stores in your area to see if you can save by shopping online. Is rice safe to consume everyday? For some, consuming rice on a daily basis can have little to no negative health effects. This greatly depends on your overall health, and the types of foods you consume with rice at each meal. Rice is widely eaten daily in Asian countries with little to no ill effect, and has been for centuries. Rice is a common ingredient in many processed foods. There was even been a diet called The Rice Diet that has been around since the 1930’s. Created by Dr. Walter Kempner and facilitated through Duke University in Durham, NC, it was promoted as a strict weight loss diet for overweight patients with other underlying health issues. The diet showed promising results to aid in reducing or eliminating high blood pressure, diabetes, heart and kidney diseases in patients. Many people may be consuming rice each day and not realize it. Rice is a very common ingredient in breakfast cereals, so if you like to eat cereal then chances are you are eating rice as part of your morning meal. Rice is also a common ingredient in granola and protein bars. A good rule to follow with rice is – everything in moderation. 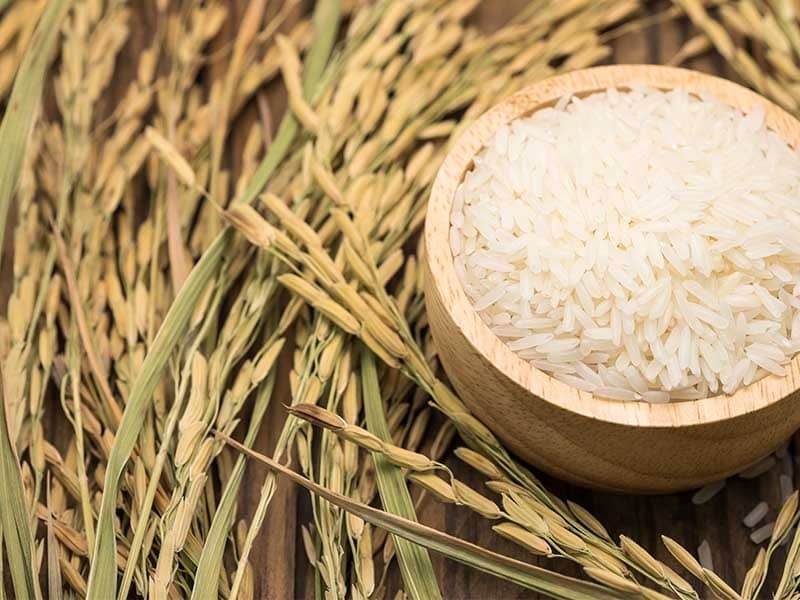 Due to its high level on the glycemic index and the lack of nutrients, in most cases white rice is best to be avoided and replaced with brown or basmati rice varieties. There is also the worry of heavy metal toxicity in some rice varieties. All varieties of rice contain some level of heavy metals, most notably arsenic. The amount can vary based on rice variety, region it is grown, and the groundwater used to grow crops. Since brown rice does not have the hull removed, it tends to have higher concentrations of arsenic than white rice varieties. This is one of the reasons that rice is not recommended to be consumed every day. 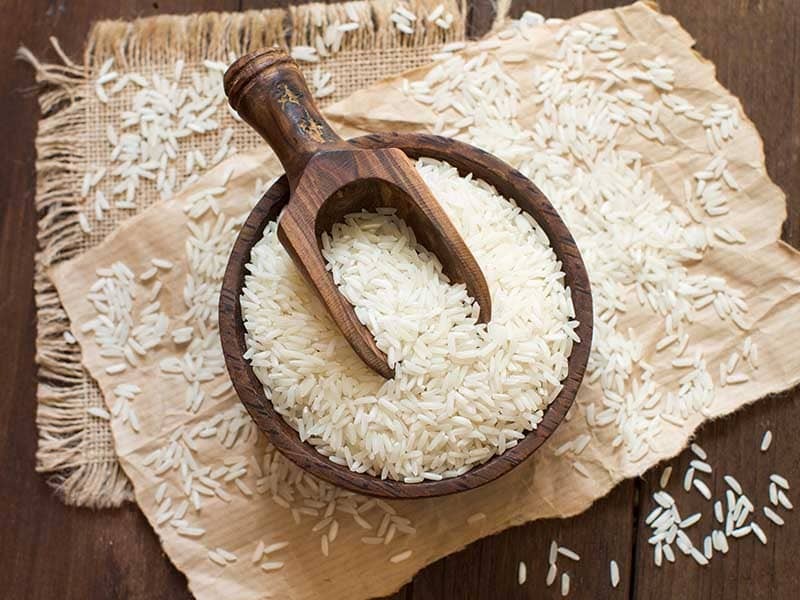 A study done on brown, white, and basmati rice types show that two changes to your rice cooking process can greatly reduce arsenic level concerns. By rinse washing the rice prior to cooking (minimum of 30 minutes up to two hours) and then using a high volume of water (at least 6:1 water to rice) when cooking reduces inorganic arsenic content by 35-45 percent compared to uncooked rice. Just make sure you toss the excess water once the rice is done! Remember earlier when we said that fitness is 80 percent diet? Well, it’s true and whether or not you have a solid food plan in place can make or break your bodybuilding goals. Rice consumption depends on your bodybuilding goals and supplement intake. Does that mean eating basmati or brown rice is healthy? In most cases, and with moderation, yes. Eating a whole-grain rice that has not had the hull removed will give you the most nutrients and benefits over other rice varieties. Now, if you are taking supplements as part of your bodybuilding plan, you can consider white rice as a good alternative due to its ability to be digested quicker than its brown counter parts. It works well combined with certain supplements to maximize energy while you are working out. White rice also helps your body absorb creatine, so if you are looking to add on muscle mass, consider eating white rice prior to taking your creatine and getting your workout in. Brown rice will always be more nutritiously sound than white rice. If you enjoy the extra flavor profile and additional benefits that basmati or jasmine rice offers, you can choose the brown rice version to give yourself the best of both worlds. The final verdict – choosing plain brown rice or brown basmati rice will likely come down to preference of the consumer – whether you plan to cut, build muscle, stay within your calorie goal, or have other fitness and health goals. We hope this comparison has helped you make a decision on which rice variety is best to help you meet and crush your goals! What type of rice do you prefer? Do you have any recipes to share? Let us know in the comments!